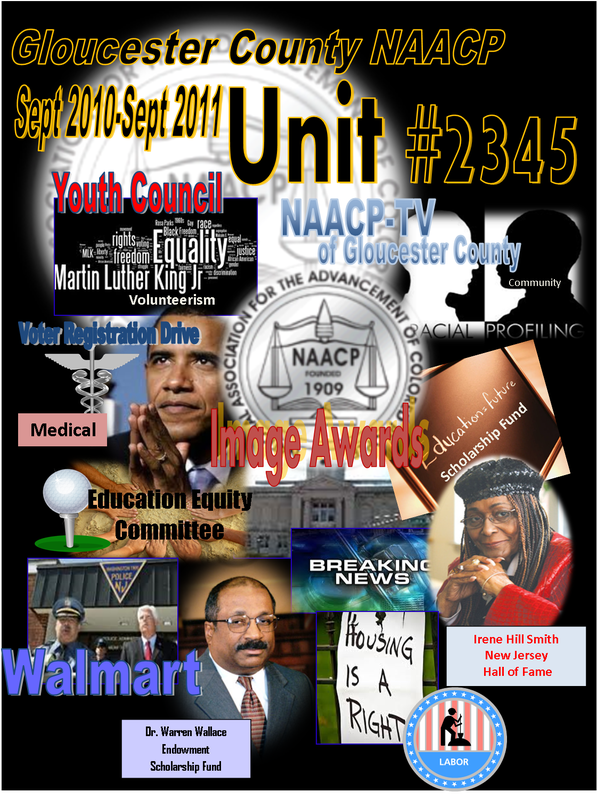 On behalf the Executive Committee and General Membership of the Gloucester County NAACP Branch #2345, I am honored to submit our Branch for the most prestigious 2011 Unit Award. In keeping with the National, State and Branch Vision and Mission Statements we have initiated action items to be a beacon in the local community; leading the charge of Civil Rights Advocacy while tirelessly working with our community leaders to achieve our goals. More important is that we made things happened and not just talked about it through invited speakers. We have introduced the following programs and have made history (local and state) by starting a foundation, a civil rights submission to the NJ hall of fame, a radio and TV program, starting an ad hoc committee with the county school superintendent and more. Please read on and see why the Gloucester County NAACP is making history and why it is the BEST Unit in New Jersey! Gloucester County, NJ is where racial profiling was finally exposed and the State police were reprimanded in our Superior Court heard by Robert E. Francis SCJ. This was done as a result of the shooting of the four students on the NJ Turnpike. As a reminder of this critical case that was heard in Gloucester County and which made global news our keynote speaker was one of the main attorneys who handle the case for the four young men, William Buckman, Esq. In addition we had the award-winning investigative journalist/reporter, Joseph Collum, there to sign his book called “The Black Dragon, Racial Profiling Exposed”. Joseph Collum coined the phrase “racial profiling” during his reporting of this case during the 90’s. For years, there have been accusations that troopers along the New Jersey Turnpike -- where virtually everyone drives over the 55-mile-per-hour limit -- were pulling over black and Hispanic drivers solely based on race, in hope of making drug arrests. The Gloucester County NAACP in cooperation with the Gloucester County Superintendent’s office has initiated an advisory board that will be known as the Equity Committee (EC). This committee is committed to ensure that the NAACP’s National Mission is achieved: “every disadvantaged or student of color graduates ready for college or a career by ensuring access to great teaching, fair discipline, equitable resources and exposure to a challenging curriculum”. To achieve this mission the committee will meet to open communications and to prioritize concerns. This volunteer and committed collaboration will be the forefront of closing the current achievement gap and to promote values of equality, inclusivity, diversity and the significance of a quality education for all. Our vision is to enhance the relationship between the NAACP and the public school community (s) of Gloucester County through a concerted exchange of experiences, information and knowledge. This valued partnership and mutual respect will work to ensure essential, constant and enduring social, governmental and academic development to safeguard equal education for all Gloucester County students. Again, GCNAACP made history by being the first in New Jersey to have a foundation at a college. We raised $10,000.00 in order to keep the name of the NAACP forever on the forefront at the Gloucester County College. Many students do not know what the NAACP has done for them historically. This foundation will keep the name alive and will eternally give scholarships each year in our name. Four out of the six scholarship awardees’ parents cried because they did not have the funds nor did they know how to equip their child with the proper resources, like a laptop, as they sent their student off to college. Because of the positive response of a laptop computer and the fact that we are giving a child what they “really need” we will continue this legacy of giving laptop computer, netbooks or tablets to our college bound students. Another bench mark initiative by the GC Branch. “Issues” the name of our TV program will start filming this month. The program will discuss hot topics such as; vouchers, taxes, pensions, taxes, social services, racial profiling, just to name a few. We want the listening and viewing audience to be informed on both sides of all issues but the NAACP will always have the last word on the program. Our branch has been vocal and visible in communicating to the local community through our monthly radio spot on 1360 AM hosted by our president and through press releases, emails and articles. We talk about issues and give answers. Another member has a weekly column in the Gloucester County Times where he spotlights political views and current events. 2011 marked the first year that all the officers’ elected to the branch were females. This historic event was highlighted in the papers and the swearing-in ceremony was attended by senators, judges, assemblymen, freeholders, mayors, councilmen & women, state police, and clergy. Our fight for civil rights was the main topic of the event while we held the attention of 20 elected officials in our audience. Dr. Irene Hill-Smith, was an Icon of Civil Rights, not only in Gloucester County, but Statewide and Nationally. Mrs. Hill-Smith served as President of the GCNAACP, President of NJ State Conference NAACP and Vice-President of the National NAACP. She collaborated with President Johnson on the Civil Rights Act of 1965 and was a confidant to Dr. Martin Luther King, Jr. We have submitted a 105 page journal, documenting Dr. Hill-Smith's many contributions for her to be inducted into the New Jersey Hall of Fame. As a result of a complaint received by our branch from an employee at Shady Lane Nursing Home, we were able to get them to revisited their policy and procedure manual and rewrite/amend several sections including discriminatory practices. Obviously unfair employment practices was the norm there and every minority was afraid to complain until we came. In addition, we were able to get a black female director of the Nursing Home rehired; training for the directors, managers and employees. In fact the NAACP will be part of the training to explain to the employees our role and that we are there for all employees. We meet monthly with the Nursing Home and talk weekly. We are there to prevent future problems not to create them. We have a very active ACT-SO committee that year after year wins gold, silver and bronze medals. We sent 15 youth to the National Convention this year. In addition we donated and/or gave fundraisers to bring over 2500.00 to our ACTSO Committee. Was it revisited to discriminate? Discriminatory practices against minority street vendors while their white counterparts have been given a pass on the State, County and Local Regulations is what is being done in Monroe Township. The NAACP has been called in and we will challenge them on this new Ordinance which severely impacts the Black vendors financially. Walmart, GCNAACP and the Coalition of Churches have joined forces to feel the hungry in Camden. Walmart is donating two million dollars to achieve this goal. So far we have feed over 2,000 families. In addition to the food we will be prescreening applicants for employment at the Walmart stores and providing transportation for those in need. To partnership with one of the local hospital was paramount and one of our 2011 initiatives. We approached the president of Underwood Memorial Hospital to discuss diversity on the hospital’s board of directors. As a result of the meeting we were successful; GC NAACP has been given exclusive rights to recommend minorities to sit on the Board. Another initiative with Underwood Hospital is to help them in the minority churches and schools with a $950K Federal Grant that they were approved for and will receive by November 2011. We were ask by the president of the board to assist them as their previous efforts to bring health programs to the minority communities failed. Branching out and embracing other minority groups in the county is a mandate by our executive board. We press upon Civil Rights for all. We have interacted with several other minority groups supporting one another for the same fight…civil rights. The Filipino community has embraced us and includes our Branch with all of their issues and fights. We are there to support them and visa versa. Membership is power!! This is the first convention attended by members of Unit #2345. In keeping with the vow to support our National Office we will send the President as our representative each year . We cannot just talk about our commitment we must show action and be about it! The Gloucester County NAACP elected the first Female Jewish officer as the Assistant Treasurer. We don’t just talk about it we make it happen. This event, which is free to the community, brings our community leaders face to face with their constituents and is also our way of saying thank you for the community's support and giving back. It is also our membership and voter registration drive. GC NAACP vowed to resurrect this chapter. The president asked one of her chairs if they would take this task on….and the rest is history. Gloucester County transferred over 15 youth members to the Youth council and within 30 days another 10 members were signed on allowing us to resurrect this Youth Chapter. Paperwork went to national the ending of 2010. By January 2011 (the next month) we had over 50 members. To date (eight months later) we have the largest Youth Group in the State of New Jersey and growing…..all in less than one year. Branch 2345 was resurrected in 2009. The year 2009 was a roller coater type of year for membership. However in since the last State convention in 2010 we were able to steady the ride and increase the membership more than 30% allowing us to only have to pay 15% assessment this year instead of the mandated 25%. In closing, The Gloucester County Branch #2345 will continue to fight the uphill battle against all obstacles placed before us. We will inform and enlighten the public about their rights. We have come a long way, but still have a battle of head of us and with God's help, we shall overcome.